Acne is a common skin condition that, according to WrongDiagnosis.com, affects almost 85 percent of people in the United States between the ages of 12 to 24. It is an inflammatory disease that is characterized by the appearance of varied lesions and blemishes on the skin. The most common form of acne, acne vulgaris, can include partially blocked pores called blackheads; completely blocked pores called whiteheads; inflamed, tender, red bumps with no head called papules; and inflamed red circles with a yellow center, called postules. In a more severe form, acne produces hard, tender, inflamed bumps deep under the skin called nodules, and inflamed, pus-filled, painful nodules called cysts. The most severe forms of acne, acne conglobat, acne fulminans, gram-negative folliculitis, and rosacea fulminans can be physically and emotionally painful and can lead to disfiguring scarring. Amoxicillin is but one weapon in the arsenal you and your doctor can use to fight acne. Acne occurs in oil-producing skin pores called pilosebaceous follicles. These follicles are present in large quantities in the face, chest, shoulders and upper back. Each pore has a hair follicle and a sebaceous gland that produces an oily substance called sebum, which is released to the skin surface by way of the hair. Acne develops when sebum is blocked in the pores by dead skin cells, hormones, oil, bacteria or other irritants, such as dirt, oil from skin products or make-up. The first line of treatment is usually careful hygiene to remove oil and other irritants that may block follicles. Over-the-counter treatments include topical lotions that kill the acne bacteria, reduce oil production, break down blackheads and whiteheads or exfoliate dead skin. Over-the-counter lotions and creams include benzoyl peroxide, sulphur, resorcinol and salicylic acid. Topical steroids such as cortisone are used sometimes to reduce local inflammation. Prescription topical antibiotics are commonly used when there are inflammatory acne lesions such as cysts or nodules. Oral antibiotics, including amoxicillin, are used for treatment-resistant, moderate to severe inflammatory acne that includes papules, cysts nodules or postules. Dermatologists prescribe oral antibiotics to decrease the acne bacteria and reduce inflammation. Amoxicillin is FDA approved for the treatment of acne, and according to researchers, it is considered safe and effective for inflammatory acne. Dosages are often high initially, and then reduced to maintenance levels. Amoxicillin is taken orally twice a day. It will take at least 3 weeks for positive effects of treatment to show, and typically will take up to 3 months to see the full effects of amoxicillin. Extended use of amoxicillin can contribute to the development of amoxicillin-resistant bacteria, so amoxicillin, and other oral antibiotics, are often used to bring acne under control and then eventually discontinued. Talk to your doctor to see if amoxicillin is right for you. There are precautions that your doctor will want to evaluate. For example, tell your doctor if you have asthma, are pregnant, taking birth control pills or have liver or kidney disease. 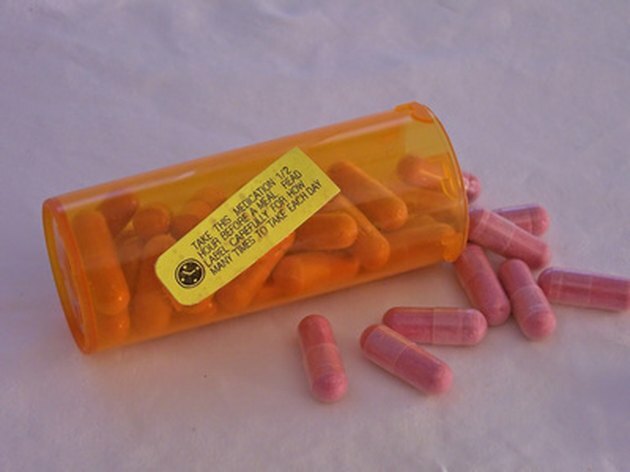 Amoxicillin can cause diarrhea and stomach distress. If you take amoxicillin, you may want to also take probiotic products that contain acidophilus, such as yogurt with active cultures, to increase the "good" bacteria in your digestive system.